Quality is important to us. 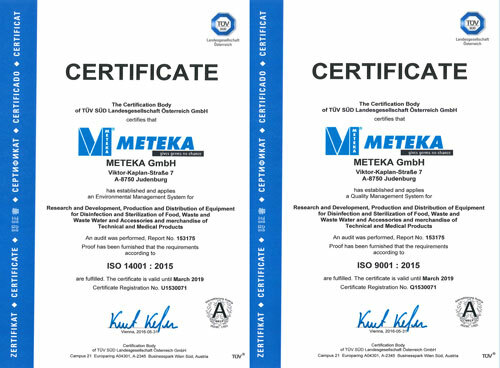 METEKA GmbH is certified according to ISO 9001:2015 and 14001:2015. High-quality components and strong quality standards offer our customer reliable and longlasting products. Comply with the current regulations of the Declaration of Conformity grants maximum saftey by using our products. 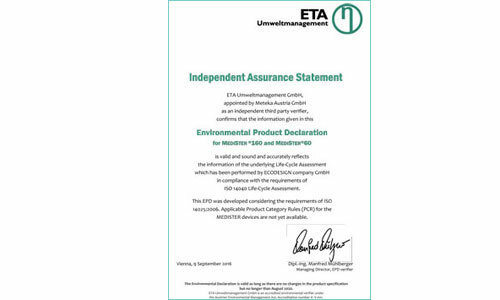 In order to better highlight the environmental friendliness of the products, we decided to have the MEDISTER devices analysed and validated from an independent body in accordance with the guidelines of the International EPD (Environmental Product Declaration) System under ISO 14040 and ISO 14025:2006. For more information please look at ENVIRONMENT.